Discussion in 'VeriTalk' started by souljah1h, Aug 26, 2016. 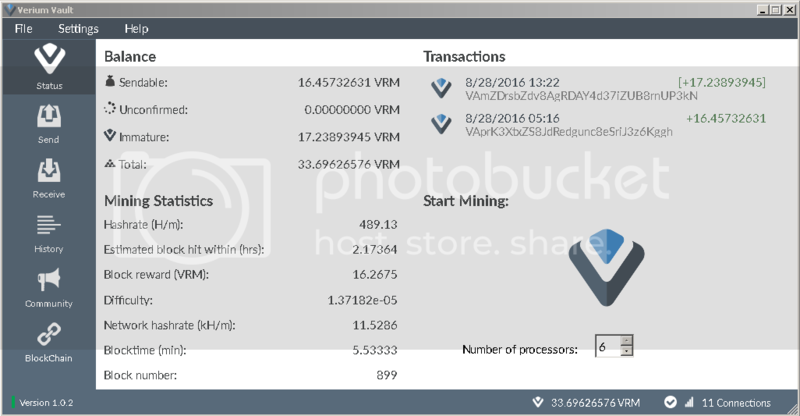 I just made a Verium Hashrate Comparision form. Please fill it in if you have the numbers. I submitted. My question is.. I have an i5 6600k 3.5 GHz with 8 GB DDR4 ram. Is the limiting factor my processor or memory? I'm assuming processor..but would like an excuse to get an extra 8 GB of ram if I knew that would increase my hash rate. With the testnet2 final parameters of 128MB, using 4 processors you only need 512 MB ram (128x4). So more ram will not help, possibly a faster speed RAM may help some, but not sure about that. As long you have the necessary RAM for all the processors the primary thing that improves numbers is the number of physical processor cores you have. Janek, ohNomang and Alben like this. heheheh 12 super rigs i7 6700k, 7.8 giga has...waiting for fun!!!!!!! These are reasonable hash rates. Look at that OC'd Core i5 pulling it's weight. You have to be Trolling right? Just saying..
Did you already fill in the Verium Hashrate Comparison? Just saw this post. Updated the form with my current miner info.. Faster than an AMD 8350?! I was inspired by "birty" on the STEEMIT blog. I have some other SBC's on order to test out relative performance. Has anyone one of the new AMD Ryzen CPUs and can do a few benchmarks? Best whould be with the veriumMiner and different thread counts to see if there is an optimal thread count. I'm wondering which of these to get for my next budget computer build, which has been long overdue: an older 8-core Intel Xeon E5-2670, which can be bought for a paltry $180 new or $120 used, or a relatively newer Core i7-5820K Haswell-E, which has 2 fewer cores but runs at a higher clock speed and which is both faster and friendlier to overclocking (up to around 4.5GHz) but is more expensive yet still relatively cheap compared to a lot of the newer higher-end chips. Does anyone have any other recommendations for a fast budget build? Edit: the Intel Core i7-3960X 3.3GHz Six Core looks good as well and can be found for around $200 used. Judging by the Verium Hashrate Comparison, where it produced one of the highest scores (as of this writing), it definitely sounds like another one to consider. Ernie_C and Devin like this. That's definitely good to hear! I'm also looking at an older Intel Xeon E5-1650 3.2GHz Six Core, which has come down in price thanks to a glut of them hitting the used market. One lucky user has successfully overclocked his to 5.3GHz but I doubt that I'd be that lucky. I'd be good with 4.5GHz, which seems to be the average overclock for that chip. I guess the only major drawbacks are 1. finding a good motherboard to pair it with and 2. the fact that the E5-1xxx series of chips can't be run in a dual configuration like the E5-2670's. A friend of mine made some Ryzen benchmarks. Doesn't look much better than a all the i7s. Top Hash rate was 2600. And it looks like no benefits from SMT. What are the top hashrates for a Intel Core i7 5820k or Intel Xeon E5-1650? My understanding is that the Ryzen cpu's have half the AVX performance as Intel clock for clock. I still like AMD and want to build a desktop once things settle down with Ryzen. Can we build a small single board cpu miner with amd processors? i think the smallest possible Ryzen setup would use the Mini-ITX sized motherboards (don't know if they are out yet). AMD is coming out with their own implementation of ARM but it hasn't come out yet. Does anyone know hash rates of the old Inel Xeon 5600er Series?